Separating gases such as hydrogen from larger compounds in the air is an important part of manufacturing and energy production. But it's also an expensive process, requiring large amounts of energy and a complicated network of heavy machinery in order to be profitable. Yaroslav Filinchuk, a professor of chemistry from the Universite Catholique de Louvain, Belgium, and Michael Heere, a researcher from the Karlsruhe Institute of Technology and affiliate of the Forschungsreaktor München II research reactor in Munich, Germany, may have a solution to this problem. 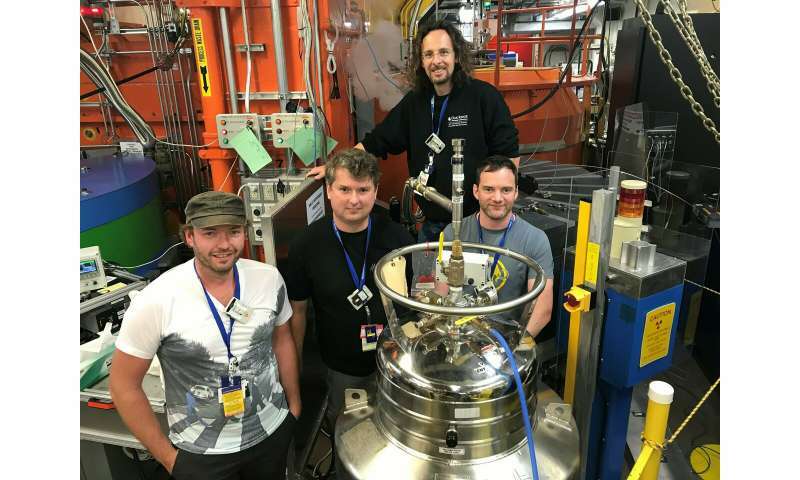 Using neutron scattering at the Department of Energy's (DOE's) Oak Ridge National Laboratory (ORNL), Filinchuk and Heere are investigating a material that could change the way we harvest valuable industrial materials. "We have a unique material. It's the first porous metal hydride material in its unique class," said Filinchuk. "We've got a sample here [Mg(BH4)2], and we're trying to expose it to different gases to see if we can better understand how it absorbs those gases." A complex metal hydride is a compound material made up of bound-together atoms of hydrogen and metal. Metal hydrides are common in certain batteries, where they're used to store hydrogen. But the pores in magnesium borohydride make it a particularly good tool for hydrogen storage, allowing the substance to take in a huge amount of hydrogen—more than twice the amount found in liquid hydrogen. What's more, those pores are the perfect size for filtering molecules like krypton and xenon from each other or from larger compounds, potentially eliminating the need for the heavy refrigeration equipment currently used to cool, capture, separate, and store industrial gases. "When you've got something that can store this much hydrogen and potentially isolate valuable industrial gases, it's pretty exciting," said Heere. Neutrons are particularly well suited for this type of research because they can deeply penetrate complex metal hydrides like Mg(BH4)2 and are extremely sensitive to light elements such as hydrogen. Using the recently-upgraded Wide-Angle Neutron Diffractometer (WAND2), beamline HB-2C, at ORNL's High Flux Isotope Reactor (HFIR), Filinchuk and Heere can precisely locate molecules of hydrogen as they interact with the material's surface, even when those particles are obscured by larger atoms within the metal-hydride compound. "This is a new kind of experiment for us. We're able to study these interactions in unprecedented detail because of the upgrades we made, which include installing a new detector, that have improved the instrument's efficiency by a factor of 15," said instrument scientist Matthias Frontzek. "Neutrons give us a really good impression of what's going on with our substance and the gases we're exposing it to. We can see molecules going in and out of Mg(BH4)2's pores like keys passing through a lock," added Filinchuk. This experiment is particularly challenging, featuring a number of unique technical hazards that ORNL staff had to take into account while helping Filinchuk and Heere prepare their project. "Oak Ridge National Lab is the sort of place where you can make these complicated experiments happen. People are willing to invest the time to help users do challenging science safely," explained instrument scientist Simon Kimber. While Filinchuk and Heere note that there's still a lot more research to do before they have a comprehensive understanding of what Mg(BH4)2 is capable of, they hope their data will be impactful. "We'd love to make a meaningful contribution not only to industry, but also to the field of material science in general," said Heere.